The Industrial Rail 7000 series bulkhead flat cars are based on a typical 40' flatcar design used on many of the nation's rail carriers. These cars feature simulated wood decks, bulkheads, and specialized loads. The 7000 bulkhead cars were produced in three road names, each with a unique load. 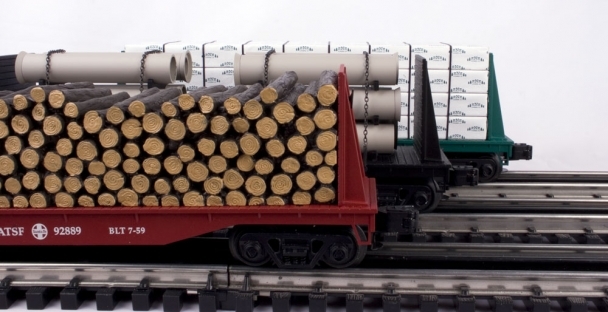 The Union Pacific car carried a chained down pipe load, the Santa Fa was given a pulp wood load, and the RNR Lumber car was sold with a processed lumber load. Cars in this series share their basic design with the series 1700 work cabooses, series 7000 loaded flat cars, and series 7500 bulkhead flat cars with stakes. Among the earliest types of freight cars, flatcars continue to serve as a valuable part of railroading. Flatcars are used to move a wide variety of loads which do not require protection from weather. These cars, are constructed with steel underframes, wood floors and stake pockets on the sides and ends for fastening tie-downs that keep loads from shifting. Bulkhead flat cars are a specialized type of flatcar designed which includes reenforced end-walls (bulkheads) to prevent loads from shifting past the ends of the car.